War zones - now and then. 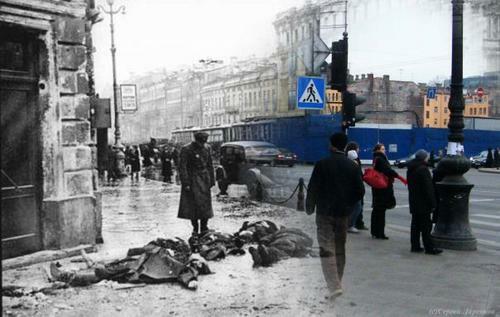 "Sergei Larenkov has photoshopped together modern images of St Petersburg with photos taken during the brutal Siege of Leningrad during WWII (at least, I think these are Leningrad, from the translations -- can someone more familiar with the city and the language confirm?). The results are stunning. I walk through East London every morning to get to work, and sometimes you can see the terrors of war superimposed on the modern landscape -- the sawn-off stubs of the iron railings that were harvested "for the war effort" (and dumped in the Channel without being turned into munitions after all), the single handsome old building stuck like an old tooth in the gleaming modern denture-work of sterile, post-War neubauten. But to see these ghost-photos is to see the invisible craters and hear the inaudible screams."